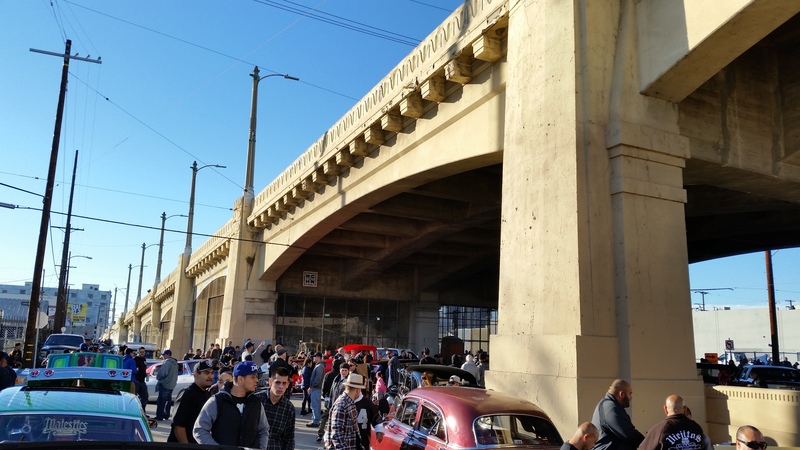 On Sunday, December 27, 2015 the Sixth Street Bridge attracted every local car cruiser, classic car enthusiast and lowrider for one last showy ride. For as long as any of us remember the viaduct has been the local focal point of the car clubs, and has also served as the starting point for cruising in our area. From all around car enthusiasts have been drawn to race in the riverbed, show off their cars in the expansive underside of the bridge, and finally ascending it to cruise eastward into the evening. The cruising culture is one of the finest manifestations of working-class subcultures. One which has long been maintained by successive generations of local Mexican American, working-class, young people and car club veteranos. Today they were all out in force. As we approached the Sixth Street Bridge the traffic approaching from the east over the various viaducts was intense. Followed by every car making their way to the parade, starting at Santa Fe Road which runs directly under the bridge and in front of the river access tunnel. And as each car arrives in procession, for a moment each car has it’s moment to shine as it briefly makes its pause. Before taking to the riverbed for a ride, or rolling in for parking under the bridge for exhibition. This day the parade route is more packed than I’ve seen it in years. As each car comes around, the scene is buzzing as the crowd admire and cameras click. Each spectator trying to visually capture a memory of this teeming stream of chrome, curves and also classic streamline bodies. Some faithful restorations, others kustom modifications, and still others yet with bold lowrider customizations. This day the underbelly of the bridge is packed with cars; lined up and basking in the golden rays of a Sunday afternoon. The cars of yesteryear properly vested in the atmosphere of the bridge’s deco-streamline modernist setting. We spend a while mingling with the crowd. As the scene turns into the site of car-side parties. With everyone sharing details about their car builds, and ladies proudly showing off their own flawless pachuca style and others their rockabilly flair. For a while we just take in the scene and the vivid nature of the site. Pensively considering the history of the car culture which is synonymous with this spot. This has long been the chosen site for the start of the East LA cruising strip, which begins precisely above us at the point of the slight curve of the classic bridge marks the transition from downtown’s 6th Street to the eastsider’s main drag of Whittier Blvd. But how long has the East Los Angeles cruising subculture existed here? What is the significance of car cruising movement? And more specifically, what role does this play in the local working-class community and the Latino youth culture of East Los Angeles? It is not possible to overstate that the city of Los Angeles has been uniquely shaped and its character defined by its reputation for having a car culture; to many this means that there is a pervasive sense of car dependency among Angelenos. The modern city we know today was very much shaped by the car. However, it is also equally important to note that the car also uniquely influenced cultural expression itself. Especially the youth culture of the city, which with the aid of the car gave birth to various subcultures with distinct forms of self-expression here. Though to explain why the car culture became ubiquitous to this area, it should first be stated that this specific side of town had developed a car enthusiast spirit quite early on. The car enthusiast energy of the area stretches all the back the beginning of the 20th century. 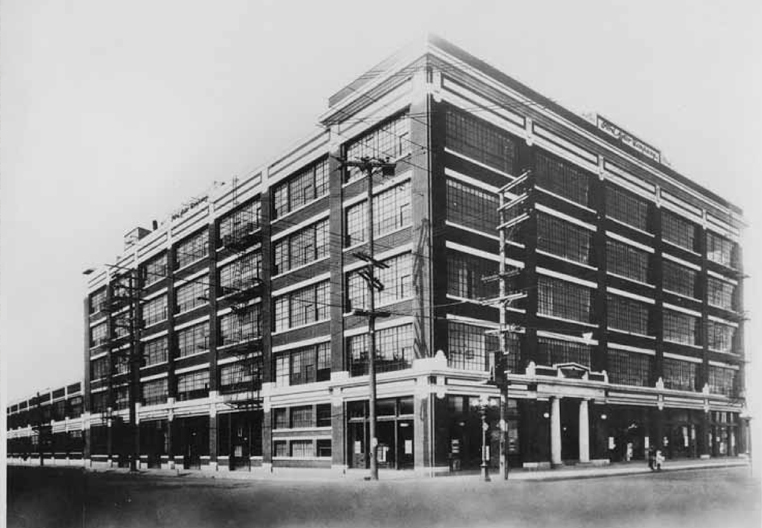 Ford Motor Factory in Los Angeles; built at Santa Fe and 7th Street in 1912; production started 1913. It is currently being gentrified. It all began when Ford Motor Company establishing their first Los Angeles plant at 7th St. and Santa Fe in 1912, from there pushing hundreds of cars off the production lines daily in order to feed the need for commuting speed across an increasingly sprawling city. The early car owners often brought these cars to the edges of the city to show off these new machines. Drawing crowds of people for spectacles of motor enabled brawn. To witness races between cars and horses, hill climbs and early speed trial races held by the early car owners at the seams of the city. Though initially car ownership was something which was primarily held by the affluent. However, that all began to change in the 1920’s – when the Ford Model-T gave way to the Ford A-Model roadsters – the technology of car making would greatly improve in bringing production cost down. Making it possible for a broader section of middle-class people to afford these newer cars. So by the mid-1920s there were tons of used cars being tossed aside, which thereby enabled car ownership for eager young people who were more than willing to snap them up and fix them up for themselves. And others who were willing to strip them down for something even more exciting yet. When young people eventually got their hands on cars, they were also naturally drawn to the outskirts of residential Los Angeles to try it all out themselves. But their exhibitions were purely for the trill of the car. Often removing the fenders and stripping the vehicles down to lessen their weight, to further push the limits of their vehicles for a thrilling ride. In our area these anxious young people and their autos often converged around the Los Angeles River and the surrounding train yards off Santa Fe Road (which was the west coast railroad terminus in those days; before Union Station); which has always been known as a dicey playground for locals kids and loitering spot for young people with nowhere else to congregate. However, the old auto spectacles would soon give way to a more defined form of car exhibition. In the early days from the 1930s through the 1950s car clubs were encouraged and sponsored by civic leaders; as a way of steering people away from youth delinquency. However, in the 1960s sociologists began to attack this group form of re-socialization as building cohesion among urban youth they perceived as gangsters. In the late-1920s the first car clubs in Los Angeles were born. And by the 1930s the youth club culture was something which was already being accepted by civic leaders, who began to support the transformation of these car clubs into officially sanctioned associations; all in the aims of steering young people away from the dangers of street-racing and youth delinquency. And thus were born the early cruising clubs. Most people don’t appreciate that the car culture, which would give birth to the hot rod and the roadster car craze, dates all the way back to these early days. While all this vibrancy surrounding the car culture would lay the groundwork for the popularization of the hot rod and the car club’s acceptance into mainstream culture, it would remain as a small subculture, being challenged by the rise of World War II. The active growth of the modern car enthusiast culture is believed to have been curtailed during the war, on account of the limitations of resources and materials during wartime. And also more critically by the military deployment of the young men who embodied this cultural phenomenon. However, these wartime setbacks would translate into gains for the movement after the end of World War II. As many of these returning men came back from war with advanced technical skill which would advance their automotive works. To this day the car culture is something which still very much benefits from the direct apprenticeship of old timers, and the energy of the youth. 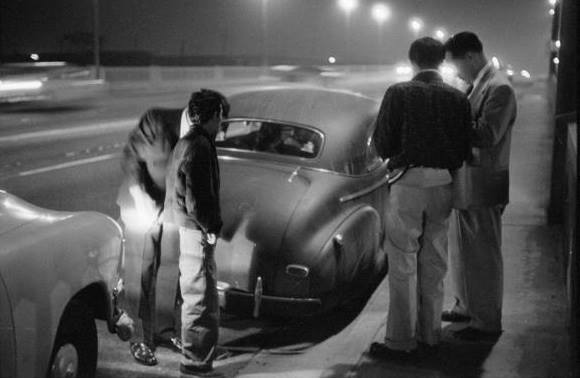 The rise of the personal automobile in Los Angles for youth also coincided with the rise of widespread racial segregation which began in the late 1920s. Racially restrictive covenants in housing became common after 1926 following the U.S. Supreme Court decision, Corrigan v. Buckley, which validated their use. And then in 1934 discrimination in home loans began. Pushing minority communities to live on the edges of the city, and relegating them to the crumbling communities being left behind by the white middle-class. Here in Los Angeles these minority designated “red lined” areas became the neighborhoods east of the Los Angeles River and South of Adams Blvd; this applied to all types of minorities including Jews, Latinos, Blacks and Asians. Most often white historians talk about how the car enabled segregation in Los Angeles at this time, and it certainly did. However, it needs to be understood that the car is also what enabled youth to challenge those boundaries. It is for this very reason the cruisers were often seen as a direct challenge to the Jim Crow system which was being more tightly woven into the social fabric of the city at that time. With their cars and clubs, these youth were exerting their freedom over these societal barriers and the urban geography of segregation. It should come as no surprise to anyone that youth of East Los Angeles and Boyle Heights quickly became enthusiasts and were often at the forefront of this cruising culture. This vibrancy of South Central Los Angeles attracted various minority groups, including the white minorities and working-class. And it was there that most of our locals became familiar with both the sound and style of jazz. As Filipinos, Latinos and Jews, along with their African-Americans friends developed a unique form of cross-over jitterbug style of their own: the Zoot Suit. I’m told by old timers that for the Zoot Suiters from the eastside there was almost no greater joy than throwing on their “drapes” and riding on over in glorious procession together to Central Ave. And that tall feeling of walking into the clubs in all their glory for a night of dancing. However, on account of the circumstances and traumas of history, the only Zoot Suiters people seem to remember today are the pachucos. It is upon these Mexican-American working-class youth that the growing paranoia of youth delinquency and the racial disdain of their era would be directed against. “Mexicans in L.A., writes historian James D. Hart, got low wages, were crowded into barrios (ghetto neighborhoods), and were generally scorned by whites. Young people were stigmatized as pachucos (juvenile hoodlums). The “pachuco generation” was a term used by historian Carey McWilliams to describe these American-born [Mexican-American] kids who reached maturity in the early 1940s. Naturally what these young people with their first taste of American success wanted to spend their hard-earned money on was their clothes, cars and the nightlife. Their obsession with American boogie-woogie and it’s lifestyle not only came with ire from the larger white society, who felt this was an affront to social decorum and distastefully encouraged mixed-raced dancing. On this side of history, what is hard for people to understand is that the pachucos and zoot suiters, that they were not hyper-ethnic hipsters. What they were was an emerging group of ethnic young people who lunged at the style and pace of American life. Young people being stopped by the authorities. And had this been understood, and these young pachucos not been vilified, othered and racialized they would have continued to fully assimilate into American culture. Instead they were violently persecuted and criminalized, by a public which felt these pachucos didn’t understand their place in society. And this really came to a head amidst World War II. At that time many Mexican manual laborers – the braceros – started coming to United States to fill wartime jobs left vacant as American men went off to war. The population of Mexicans increasing significantly during this time. Also with the interment of the Japanese of Little Tokyo, the neighborhood there would begin to swell with African-Americans and Mexicans; and would at this time come to hold the title of “Bronzeville.” The nightlife would thus move more closely downtown, and naturally brought these young people into direct and uneasy contact with downtown society. In addition, these complications of wartime also exposed them to hostility from US servicemen who had flooded into the area during wartime. And the attacks of newly arriving mid-westerners who were often unfamiliar with and intolerant of ethnic minorities. Servicemen of the day were regularly incensed by the appearance of the lack of support in uniform by Mexicans during WWII, all the while accusing Mexicans of making out well financially in industrial jobs they were called up to fill as the war raged. This precipitated into the Zoot Suit Riots of 1943. Which was not any one event, but a series of riots throughout the city directed against this youth subculture, especially the Mexican-American Zoots. Though during this time many cars were mostly parked because of gas rationing limitations, servicemen would still drive up from as far as San Diego by the carload in order to beat the hell out of Zoot Suiters in Los Angeles. All with the instigation of the media, and the tactic approval and even repeated assistance of the police. Zoot suit riot erupts in front of the Hippodrome Theater on Main Street, Downtown Los Angeles. Zoot Suiter youth beaten and stripped naked. In the aftermath of the riots which raged for a week, many Latino young were arrested and thrown into the criminal system. And in the panic of what the county saw not as mob beatings but instead as race riots, the Los Angeles civic leaders called upon east coast sociologists to help them address this crisis they saw on their hands. Quickly, these sociologists came to define our youth clubs as “gangs,” and by extension their members “gangsters.” Projecting on to our local youth their mobster problems of Chicago, Detroit, Philadelphia, etc. And through criminal institutionalization, made this a self-fulfilling prophecy; Mexicans Americans forming their own mafia only later, while incarcerated. And in the panic of what the county saw not as mob beatings but instead as race riots, the Los Angeles civic leaders called in East Coast sociologists to help them address this crisis they saw on their hands. Quickly, these sociologists came to define our youth clubs as “gangs” and their members “gangsters.” Projecting on to our local youth their mobster problems of Chicago, Detroit, Philadelphia. And through criminal institutionalization, made this a self-fulfilling prophecy; Mexicans Americans forming their own mafia while incarcerated. Rioting servicemen stripped some zoot suiters of their clothes in public. According to the Examiner’s caption, this arrested teenager took the turn of events ‘philosophically.’ Courtesy of the Los Angeles Examiner Collection, USC Libraries. Even though during the span of WWII was considered a lull for the advancement of the car culture, the events of this period had a dramatic effect on how it emerged post-war. The public and law enforcement would for decades be gripped with fear of new riots. And in the shadow of looming fear of dark-skinned people imminently rising up in vengeance, which never really happened. Nonetheless, because of these traumatic events the civic leaders and law enforcement would become further obsessed with youth delinquency, gang violence, and protecting youth from intermingling with adults. And were now more than ever intent on keeping youth clubs in their own neighborhoods. And this is how the perception of our cruising Latino youth as rolling gangsters came to be; both an insult, and a historical blunder. After the end of World War II and the Korean war, many people returned from war to pick-up their car enthusiasm again. Aside from the technical skill which many gained during their wartime service, these veterans also come home with the benefit of the GI Bill. Which gave them the ability to buy new cars, and the money to invest into their cars. However, in the years after the war the older pre-war car parts became much more expensive to produce. And new cars became much more costly as well, as the hot rods would begin to make their way toward mainstream consumerization. In these post-war years the civic leaders once again began promoting car clubs; again to promote safety and deter from youth delinquency. And with the commercialization of show cars and hot rods, this also provided commercial sponsorship. While this granted legitimacy to mainstream middle-class car enthusiasts with the newest and best cars, this also began to further cause a disparaging of the working-class car culture. The respectable white, suburban car clubs with the benefit of community approval and commercial sponsorship; these car driven social clubs, they rose up as uppity socials. While the same manifestation by the unsanctioned working-class car clubs, these hepcats in their rebuilt “bombs” were labeled greasers. The car clubs of Boyle Heights, East Los Angeles, were born as a racially diverse, working class movement. As it remained for several decades to come. 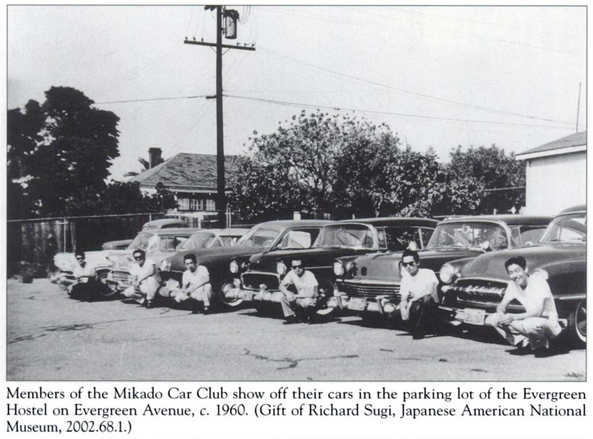 Mikado Car club at the parking lot of the Evergreen Hostel, circa 1960. Japanese-American hep cats and their classic cars. It is essential for us to remember though, that the eastside car culture persisted as something that was mixed race for years to come. And the reason is because the transformation of the eastside from an ethnically mixed working-class community to a nearly entirely Latino enclave was gradual. And for years to come the promotion of the eastside cruising culture would be a multicultural manifestation of the local working class. The hands-on nature of the eastside car culture would be maintained from the post-war years and for decades to come by white, Latino and even Japanese hepcats. And the place of meeting, it became the now paved Los Angeles Riverbed; one of the few places in the area teens could race their cars, as well as have car exhibitions. And the path for cruising, it directed itself over the bridge and down Whittier Blvd towards East Los Angeles; with the procession itself becoming a mobile way for people to both party and mingle their way into the nightlife. One of the few places people could race on the eastside was on the riverbed. In 1964 some people even had suggested that the paved area be designated as a racing speedway; though it never came to be. In time the car culture of Mexican-Americans would begin to distinctly emerge with its own character and style. And ultimately manifest some playful touches, culminating in the form of the lowrider. Consider this for a second. When most communities talk about their car clubs, it usually involves racing. And this was most often the case in white, middle-class communities. And even more so in the suburbs and outlying communities. Though it should be noted, racing did occur on Whittier Blvd itself; though only in the more affluent suburban cities of Whittier and La Habra, where it was often was given a blind eye. However, here in the working-class and more ethnic urban sides of town, speed was a privilege we couldn’t enjoy; with serious racing being too costly of a pursuit, and illegal street racing far less tolerated by our local authorities. Therefore here in East Los Angeles our style emerged not based on the thrill of speed, but on the stunning effect of rolling bajito y suavecito – low and slow. The cars themselves became the full show. And in order to accentuate this sense of parading, cars were often modified. This started as early as the 1940s. First, as people started adding frame skirts to cover back wheels, and even beaver backs to cars in order to exaggerate that land yacht effect. Rounding off the edges of their cars with sleek and wide curves. And then in the 1950s people took it one step further and started altering their suspension, lowering their blocks, cutting their coils, and tweaking z-frames. Lowering cars also became much easier later on with the development of x-shaped frames in 1958. In time this lowrider style, and all its flamboyance would be carried over to the more modern car and influence even more futuristic vehicles as well. 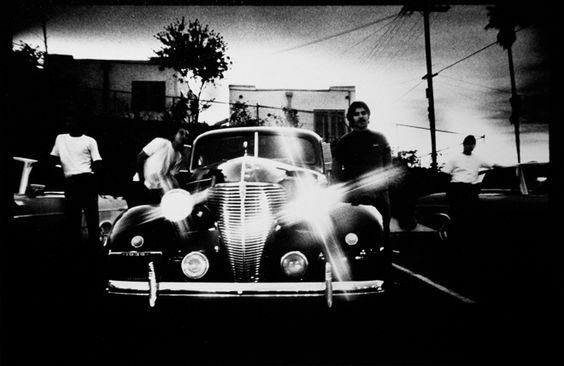 The lowrider quickly became the ubiquitous symbol of the Mexican-American car culture. Intended to be showy, and even seductive. Together these cars creating an armada of chrome vessels, leaving a party atmosphere in their wake. Carrying car loads of cruising guys and girls, mingling from vehicle to vehicle in a carnival of traffic. And this of course troubled the authorities and the public; worried about the traffic and questioning the safety of these vehicles. In response to this concern, in 1958 Section 24008 of the California Vehicle Code was enacted; which limited the types of lowering modifications one could make to their car. Including the requirement that no part of the vehicle be lower than the bottom of the wheel rims. Which in a single, clean strike of legislation seemed to outlaw the lowrider. However, this would not be the end of this style. Indeed it only gave the lowrider image a new rebel mystique. And it also lead to the most amazing evolution of these vehicles yet; with the addition of hydraulics. In this early days this was achieved with adding aircraft hydraulics to one’s ride (which the x-style frames were ideal for). So that with the flip of a switch one could raise their car, in order to clear an obstacle or even avoid ticketing from cops rolling up at your side. And then with another flip, return back to a lowered cruising posture. The addition of hydraulics would of course eventually inspire the hopping which is also a dramatic part of this form of street exhibitionism. Today the most distinguishing characteristic of many of the lowriders of East Los Angeles would be their flashy Latino style. Many of these more bold, modern and lush touches – the layered paint jobs, and airbrushed designs; the crushed velvet interiors – this would emerge with the rise of the Chicano civil rights era starting in 1968. Lowriders became a major player in the image of the Chicano movement at that time; it was then that the lowrider would rise-up as symbol of the agency of Latino culture itself. And therefore also subject to further racial and class oriented scorn. For these reasons, despite the style and the fancy touches given to these working-class rides, they would continue to be branded as rickety and dangerous jalopies. And a reoccurring object of scorn by the establishment. Though the cruising of Whittier Blvd has be a staple of the car culture for as long as anyone can remember, it has come with its ups and down. In Los Angeles there were also several other popular cruising strips as well. Among them being the Hollywood Sunset Strip, Firestone Blvd in Downey (near the Harvey’s Broiler), Tweedy Blvd in South Gate, and also Van Nuys Blvd in the San Fernando Valley. Generally cruising had to have a social destination. And this often meant the cruising oriented heading towards popular hangouts and night spots. Over the years the procession of cars here on Whittier Blvd. had headed ever more eastward. Eventually making its way into the commercial center and down the shopping corridor of East LA; near the more affluent area of old Belvedere. This didn’t sit well with the still mostly white store owners and the more middle-class residents. Lowriders and their cruising became seen as a more dangerous public nuance. Though the hight of the cruising phenomenon of Whittier Blvd was in the 1970s. The car clubs membership would wax and wane, sometimes consolidating and other times restructuring; car clubs activity had highs and lows through this decade. The biggest challenge came in the late 1970s, when Whittier Blvd was closed to cruising. By that time the demographic of the area and almost entirely become Latino. And it becoming a destination for more and more Latino clubs. However, it also was well known to attract gangs as well. 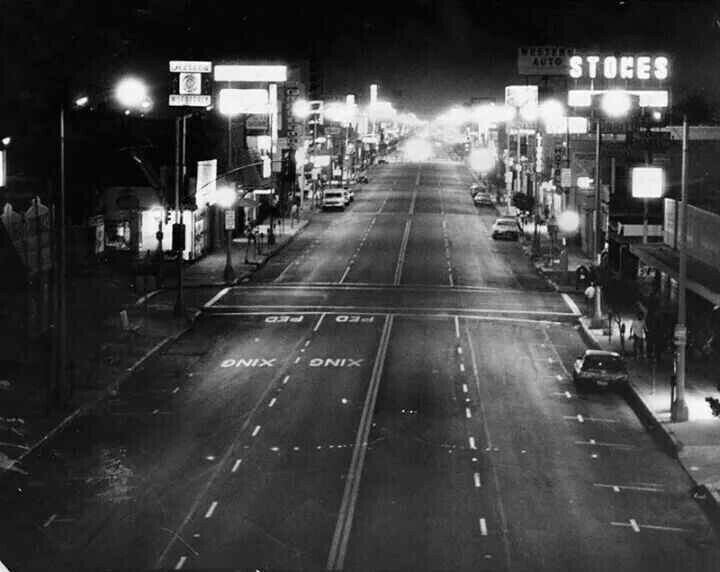 And the blvd often became a place of not just a party atmosphere, but also a volatile center which attracted many conflicting gangs and crews. Starting on Friday, March 23, 1979 in response to the violence, vehicular cruising was banned entirely. 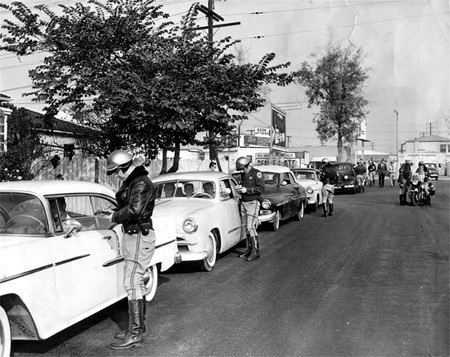 And here in East Los Angeles, Whittier Blvd was blockaded starting at Eastern Ave. With the intention of protecting the boulevard’s shopping district of East Los Angeles. 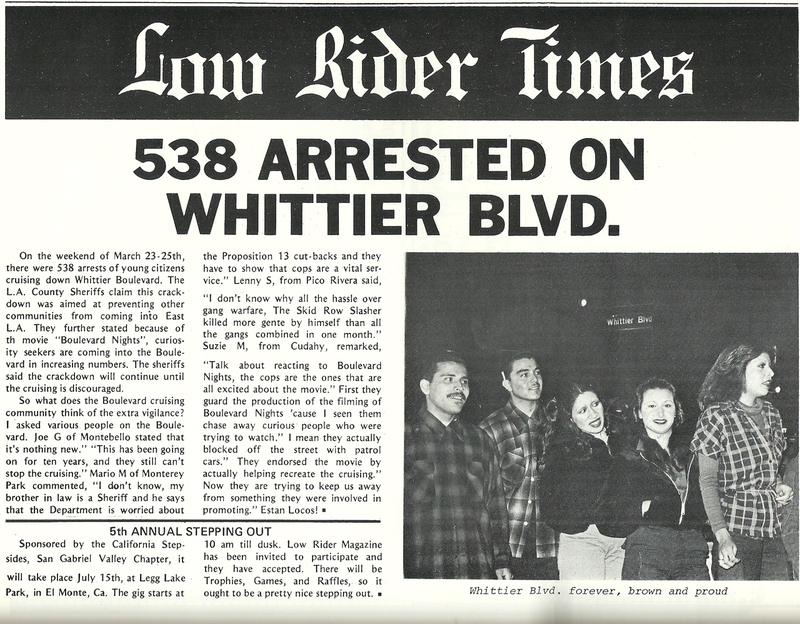 “Whittier Boulevard was again closed in the late 1970s because law enforcement continued to make the claim that gang activity were directly related to cruising on East Los Angeles’s [sic] main street. However, despite the reality of there being negative elements which did come along with this cruising phenomenon, it would be wrong for us to only focus upon that, and dismiss the other truth that the car club culture also still continued to presented itself as an alternative to gang membership as well. As it had since the days of the early car clubs. However, this reality is still sadly overlooked. And the history of car clubs as socially positive groups became almost completely obscured and forgotten at this time. The ban on cruising would be maintained throughout the 1980s and for the next decade. And the war zone and police state atmosphere of Whittier Blvd of those days is something that even I personally remember to this day. And so I can say with certainty that the cruising culture didn’t stop just because of a few road blocks. Actually in the end this motivated the cruisers to just go around the barricaded intersections, often making their way into the residential neighborhoods from East LA to Pico Rivera. As a kid I vividly remember the excitement of all the flashy cars, and also the drama of the police spectacles. My family often getting caught into the caravans of traffic by chance. And other times by my watching the cars as they diverted through the residential neighborhoods my family members lived in, shinny cars being pursued by flashing helicopter search lights. Leaving me with my face pressed up against glass windows, thrilled by it all. And a few times, I even joined my older uncles and cousins cruising! 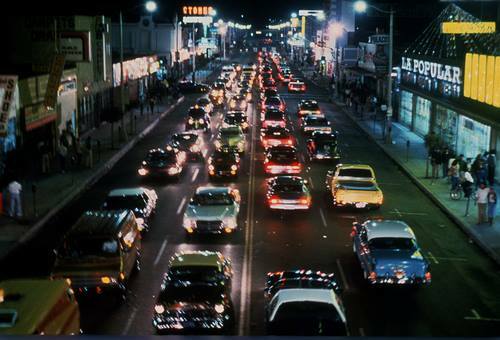 First night of the Cruising Ban; Whittier Blvd, East Los Angeles, March 23rd, 1979. Eventually by the mid-1980s the Sheriff’s Department would move their barricade more to the east; eventually barricading traffic where Whittier Blvd met Rosemead Blvd in Pico Rivera. Diverting cars north, towards an inevitable destination at Legg Lake Park by day and away from heading towards the suburban core of the City of Whittier. And by night, preventing the mass of cruisers from gathering at the Tommy’s Burger and Mario’s Tacos parking lots in Pico Rivera (again, due to gang violence). So by the 1990s if you actually made it as far as Durfee Road, you were considered boss! Eventually cruising was banned again in 1992 under the guise of anti-loitering laws, which were drafted by their sponsors with the city’s anti-gang ordinances in mind. From the late-1980s through the early-1990s the cruising culture would be maintained in East LA by a few die-hards. 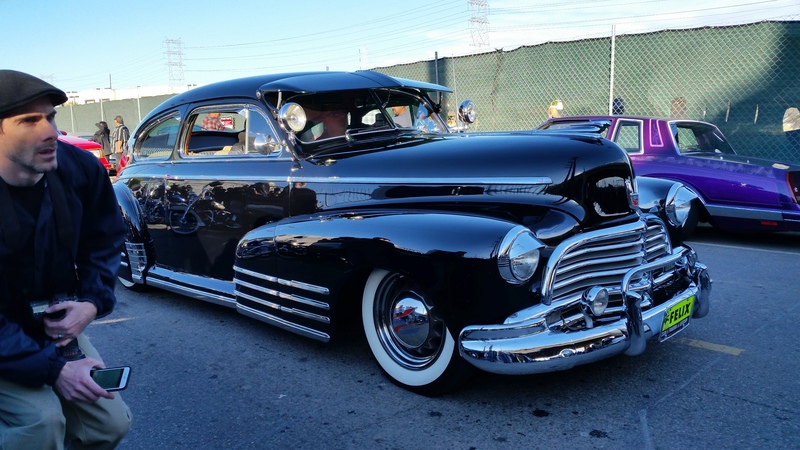 Though the old car cruising clubs would continue to shrink, with many lowriders instead focusing their energies towards show cars and classic car competitions. Which shows how the car clubs and working-class car culture ultimately found a way to once again challenge racial boundaries and make new connections across the city; as they had since their earliest days. Though the street presence of the car culture seemed to decline for many years, the popularity of the working class car culture has proliferated. So much so that by the turn of the turn of the 21st century it had moved from being a subculture, into being a celebrated form of expression by the popular culture. Today if you walk up to any major newsstand you will find various classic car, hot rod and lowrider magazines. Filled with amazing oral histories of the car club veterans who helped propel these movements forward. The working class car culture is something which today is a much respected form of urban expression. Even though it still holds a certain type of outlaw repute by those who remain inappreciative. However, I ask people to look around at the car club events of today and take notice of the diversity of people who attend. And more importantly, notice that the now senior-aged leaders of the original clubs have now become respected veterans of this local heritage. And they most often speak as honored sources of technological, historical and cultural wealth. And also take notice of how the car culture continues to find new energy in the youth. Who continue to revision this urban expression for themselves. Youth who have continued seeking out the apprenticeship of the car club veterans; fathers, grandfathers, uncles, and elder friends. In the past two decades, the cultural trends of our area have also helped spark a revival in the kustom car movement. Which has brought new life and passion for the car clubs. Both as an expression of the reemerging Chicano street culture, and also the all-American rockabilly subculture which is common to many working class eastsiders. Though I believe the biggest sign of the sustained vitality of the local car culture has been the meet-ups and car cruise nights which still center around the Los Angeles viaducts. The cruising from this spot has never really gone away. 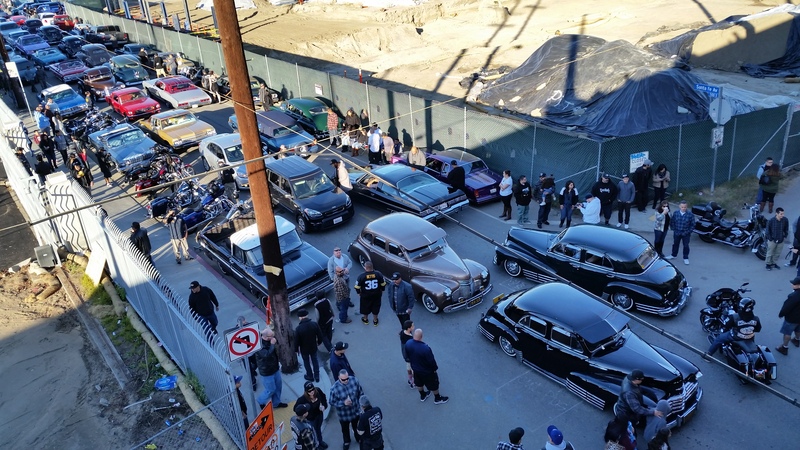 In fact, this passed February the local car clubs teamed-up to revive the old Whittier Blvd cruising route. Starting from underneath the soon to be demolished Sixth Street Bridge and again heading towards East Los Angeles. These meet-ups have attracted the older guys and their classic cars, to enjoy a final ride to recapture their glory days. And the younger people as well, who just want to try to capture some treasured memories for themselves. The question still hangs on the minds of people: Can the local working class car culture of the area survive the wave of change which is coming to the eastside? And will the demolition of the Sixth Street Bridge place in jeopardy this age old tradition; not just by displacing and diverting the cruise route, but also blocking access for riverbed drives for years to come. In light of the plans for the new Art’s District amphitheater planned for the underside of the new Sixth Street Bridge at the entrance to the riverbed at Santa Fe (in addition to the push for revitalization of the Los Angeles River), there is much doubt as to whether our car clubs will have anyplace to return to here once the redevelopment project is completed. With all of this nostalgia and uncertainty hanging thick in the air, people have continued to come out in droves for these final days. And I suspect in increasing numbers right up until the very end. The joy of the holidays are found in that warmth we get from remembering holidays past, and the magic of the season is found in how we rekindle these memories anew. During the winter months the cultural and religious traditions of the area seem to shine the brightest. When during the winter months people of our various cultures display their festive ways to bring brightness to the darkest time of the year. When the days and short and the night are longest, the spirit inside of us just longs to brighten up the darkness. Catholics brighten up these winter nights in the neighborhood of Boyle Heights with las posadas (processions) and bright nativities; from Christmas time and through Three Kings Day. Protestants as well, with their stirring candlelit Christmas vigils. And our Armenian neighbors too, with their celebrations of the eastern orthodox Feast of the Nativity and Epiphany also on January 6th; when their churches will light lamps and the faithful will hold candles according to their ancient custom, symbolic of the presence of the holy spirit in their lives (yes, we even have an Armenian Catholic church in the area as well!). These are commonly shared themes in many faith traditions. And the holidays are nothing if not about tradition! If you haven’t noticed, I’m a pretty old school cat. So I get a lot of joy out of keeping the old traditions alive. One of the ways I have been connecting to our old school Jewish heritage of the area over the past few years has been to light old classic style olive oil Chanukah lights with my friends in the community of Boyle Heights. To share the celebration of the miracle of the oil lamps – commemorating when in ancient times Jewish rebels recaptured the Temple in Jerusalem, relighting the Menorah’s sacred oil lights that were miraculously sustained for eight days on one day’s oil, until more sacred oil could be made. This is a bright celebration of culture and faith, overcoming imperialism and hegemony. And as the haftarah reading from the prophets for this holiday reminds us: “Not by might, nor by power but by My spirit says the L-rd of hosts.” (Zechariah 4:6); this is a festival when we celebrate the power of spirit over militaristic might. This is a message many of us around here can identify with culturally, if not religiously. Among my friends it has been a time to share Jewish traditional holiday treats and stories of our warmest memories of years gone by, sometimes joined by a few local Jews who grew up in the area and who are still found in these parts. This year we were intent on lighting the Chanukah lights up on top of the Sixth Street Bridge for the last time, before the bridge comes down. As the viaduct is set for demolition over the next few weeks. Ordinary I do havdalah on the bridge, so figured I could pull it off with Chanukah lights. 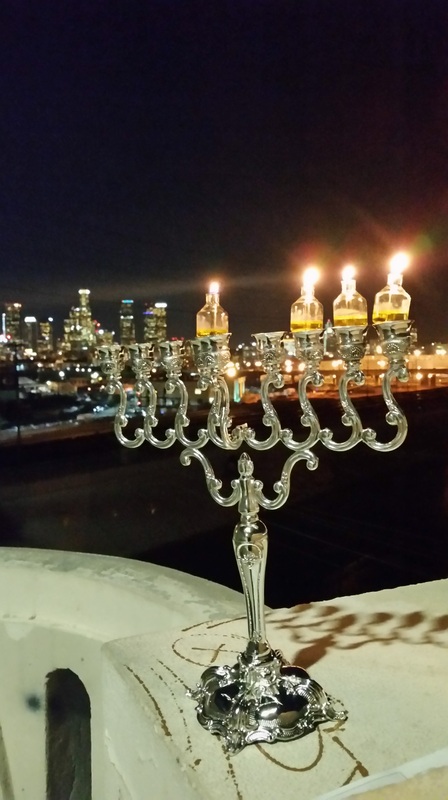 So I brought with me a most beautiful, silvery chanukiah to light – a traditional Chanukah menorah, and lit it on the Boyle Heights side of the bridge just east of the river. In previous years, I have brought travel sized menorahs and done guerrilla-style lightings around town. Though last year I had promised that I would buy a new, big boy’s sized menorah, to add some beauty to the mitzvah of lighting with olive oil lamps; one which is reminiscent of what many Jewish families of the area would have used in the classic days of the Yiddish eastside. The question is, where do you find such a thing around here? Are there any Jewish bookstores or Judaica shops in the area? Aside from the small gift-shops at our local synagogues, where does a local find their religious Jewish items? One of my favorite shops is Solomon’s Judaica and Bookstore, on Fairfax Ave. in mid-city, but was originally founded right here in Boyle Heights. In fact, I often find myself buying from shops off Fairfax which used to be located right in our own eastside community when Boyle Heights was then the heart of the LA Jewish community! Solomon’s was founded in Boyle Heights almost 80 years ago, operating a shop on Brooklyn Ave. (now Cesar E. Chavez Ave.) just a couple of doors down from the original location of Canter’s Deli. They were among the businesses which later relocated to the Fairfax with the mass migration of Jewish families heading that way some 70 years ago. Today as both Boyle Heights and Fairfax are once again going through tremendous changes which seem to be jeopardizing the classic and cultural character of these neighborhoods, it’s nice to know that some family run businesses like these are somehow managing to remain in loving service to our changing communities. After having a wonderful time lighting the new menorah on the old Sixth Street Bridge in it’s final days, people keep asking where I’m going to do a public lighting for Chanukah next year. The suggestion I really like the most is that maybe next year we should do a public lighting off of old Brooklyn Ave. itself, where the story all started. To really bring this cultural history which we share together completely full-circle! Happy holidays and a blessed new year to one and all! One of my favorite shops is Solomon’s Judaica and Bookstore, on Fairfax Ave. in mid-city Los Angeles. They are one of the shops on my list which I feel like I need to visit during the holidays, along with the Jewish bakeries and kosher food shops. Over they years I have made this trek countless times, to bring all the essential items of Jewish life back with me this side of the river. Many times buying from shops in the Fairfax, which were once located in Boyle Heights when the eastside used to be the beating heart of the Jewish community! Solomon’s Judaica was founded almost 80 years ago out of the Solomon family’s home living room on Chicago Street in Boyle Heights. Later opening a small shop on Brooklyn Ave (now Cesar E. Chavez Ave.). They then relocated to the Fairfax district, with the mass of Jewish migration which went westward some 70 years ago. Solomon’s is among those handful of time-loved shops, which Jewish families have been coming to for generations. Over the years I have met many people who tell me that this is where their family came to buy all their religious Jewish items – a yarmulke, a tallis, a prayerbook, etc. To purchase all the items one needed for their special occasions – bris, bar mitzvahs, weddings, etc. Elimelech Solomon, the fourth generation of his family to be born and live in Jerusalem (in what was then Palestine) made a fateful decision in 1926. At that time he owned a grocery store to support his family. During an Arab pogrom, his store was looted and ransacked and he was left with nothing. Hoping to find a better life for his family, Elimelech left for America, not unlike his ancestor Reb Zalman Solomon who, a century before Elimelech, left his native Lithuania for a better life and became the first Ashkenazi Jew to arrive in Jerusalem in 1812. Elimelech settled in Boyle Heights where he was barely able to make enough money to sustain himself. First he worked as a m’shulach (fundraiser), collecting money for Talmud Torah religious school and Bikur Cholim, hospital care. Later he served as a mashgiach, inspecting kosher meats. Back in Jerusalem, Chaya, then pregnant with their fourth child and the three other children had to survive on what little money she could earn by helping neighbors with ironing and odd jobs. Elimelech wrote home often, but it would be ten years before he had enough money to bring his family to the States. In 1936, Chaya and the four children (Masha, Pinchas, Moishe, and Naftali, a ten-year-old who had never seen his father), traveled from Jaffa to Marseilles by boat, then by train to the port of LeHavre, where they boarded a boat to New York. Eventually they arrived in Los Angeles by bus. The Solomon family home, where their front room became their first showroom. To help with expenses, Chaya’s brother in Israel sent Judaic artifacts for her to sell to the growing Jewish community. Chaya placed a sign in their front room window and soon customers came to inspect her wares, displayed on a table in the living room where, at night, the three sons slept. People came to buy at all hours of the day. Often the Solomons were one of the first to learn about upcoming important events in the community–a marriage, a bris, a bar mitzvah–when families came to buy ceremonial items and gifts. From these humble beginnings was born one of the first Judaica businesses on the West Coast, Solomon’s Hebrew & English Book Store. As they became more successful, Elimelech and Chaya moved the business out of the house and set up shop in a section of a butcher’s store and later a key shop. Eventually they expanded and moved into their own store on Brooklyn Avenue (now Cesar E. Chavez Avenue). From Israel, they imported gift items such as olive wood objects and filigree jewelry. Everyone in the neighborhood knew that if anything religious was needed—a machzor, a tallis, a yarmulke—it could be found at Solomon’s. The Solomon children helped out in the store occasionally doing whatever was needed: from waiting on customers or weaving lulavim to polishing the silver or cleaning. One more child, daughter Miriam, was born in Los Angeles. As a young girl, Miriam sat outside the store, selling Jewish new years cards and encouraging passers-by to come into the store. Chaya’s keen business skills complimented Elimelech’s gregarious nature. He loved to kibbitz with customers. He used to say, “King Solomon had a thousand wives, but I have only one wife and thousands of items in the store.” Bills for books the couple sold to synagogues and religious schools often went unpaid because of Elimelech’s generosity. Chaya would prepare dinner in the morning before she opened the store so the family would have dinner ready for them. Elimelech would come in later and unpack and price merchandise until midnight. The Solomons attended the Breed Street Shul, but during High Holy Days, Elimelech served as a cantor at other synagogues. He passed down his skills to sons Nathan and Moishe who often performed holiday cantorial duties as adults. Their daughter Masha sang solos and duets with her father as she sat in the first row among the congregants. After twelve years in Boyle Heights, as the Jewish population moved westward, the Solomons moved their store to its final location on Fairfax Avenue. The long narrow store was lined with shelves on each side. One side held candlesticks, spice boxes, and jewelry; the other side had wine and every imaginable book on Judaism from ancient texts to Jewish cookbooks and Jewish newspapers in many languages. Jews from around the world ordered items through their mail order business. Even after Elimelech’s death, Chaya and her sons Philip (Pinchas) and Nathan (Naftali) continued to run the flourishing business. The sons who were educated at a New York yeshiva, also answered phone calls received daily from people with questions on Jewish customs and rituals. Despite suffering from debilitating arthritis, Chaya continued to work well into her eighties. Finally, in 1986, after being in business for more than 50 years, the family sold the store to Jews from Iran who retained the store’s name because of its good reputation. Though she no longer worked there, Chaya sometimes visited the store in her wheelchair, greeting old customers and answering the new owners’ questions such as how to price certain items. Today, Elimelech, Chaya, and their two children Masha and Moishe are buried in Israel. Philip, Nathan, Miriam, their spouses, and many of the ten grandchildren fondly remember Elimelech and Chaya and the legendary bookstore known simply as Solomon’s. 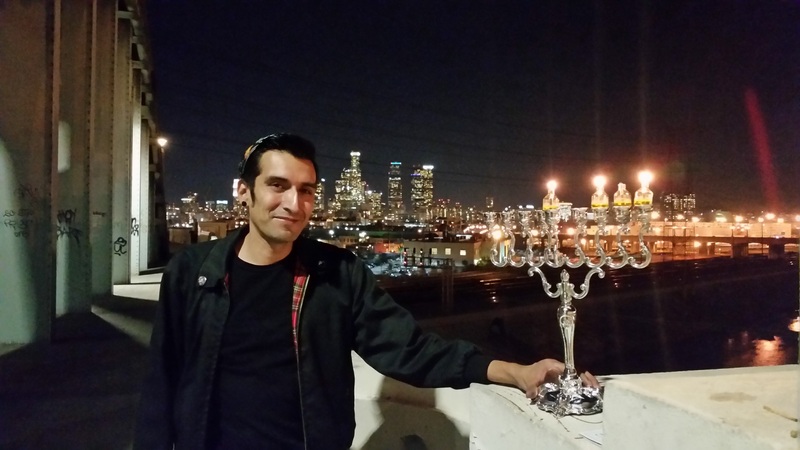 This year I needed to buy an old school styled olive oil Chanukah menorah (chanukiah), to bring back home and to share the festival lights with the community in Boyle Heights! I couldn’t think of a better place to buy from. Solomon’s Hebrew & English Book Store. now at 438 N. Fairfax Ave. Nor could I think of a better way to bring our shared history full circle. Though my choice to buy from this store is not just based in tradition and the impulse to buy from a shop which is as familiar as an old friend. It is to show support a fine business which is falling on tough times. In recent years, Solomon’s has been forced to downsize and restructure due to rent hikes. They have also moved storefronts a couple times over the past few years, and are now located on the other side of Fairfax from their longtime location. Now situated directly across the street from Canter’s Deli. In a storefront which used to be part of good old Simon Rutberg’s Hatikvah Jewish record shop, as revealed by the remnants of the old neon record sign out front. Fairfax has for several years been feeling the stress of urban change; as the hip-hop street-ware scene has taken shape in the district, raising rents ever higher and displacing several older Jewish shops, a creating some frictions. And as gentrification has taken hold here, recently being most egregiously displayed in this very district. Some people wonder if these changes are going to put the distinct Jewish character of this area in jeopardy. I personally doubt that the Jewish flavor of the area is going to quickly disappear. As Fairfax Ave. is still home to many of our favorite cultural Jewish hot-spots and Jewish-style eateries, which maintain this areas own character which is distinct from that of the more orthodox community that has pushed ever westward into todays “kosher corridor” of the Pico-Robertson. Though all this change going on does leave many wondering what the future is for the handful of religious Jewish shops and institutions such as these, as Fairfax has for some years been moving away from being the central focal point of religious Jewish life in LA. While this shop has certainly never made the owners rich and has always been but a struggling little business, for generations it has enriched the Jewish community both in Boyle Heights and Fairfax. Let’s hope it’s legacy and charm lasts for many years to come! The original Solomon’s Hebrew Bookstore storefront at 2217 East Cesar E. Chavez (left). A block over from the original Canter’s Deli location (located at 2323); right here in the heart of the old Brooklyn Ave. shopping district. Today the storefront is part of La Chispa de Oro Restaurant.